The DISC’17 conference will be held at Austria Trend Hotel Park Royal Palace, at Schlossallee 8, 1140 Wien (Vienna), in close proximity to the Vienna Technical Museum and with views of Schönbrunn Castle. To book rooms at the negotiated rate, please use the link provided in the registration confirmation email. The venue can be conveniently reached with U-Bahn (subway) or tram. Coming from the VIE airport, the simplest public transport route is to take the suburban railway S7 (cheaper) or the dedicated City Airport Train CAT (faster) to “Landstraße (Bhf. Wien Mitte)” (for more details and current fares check how to get from airport to center). 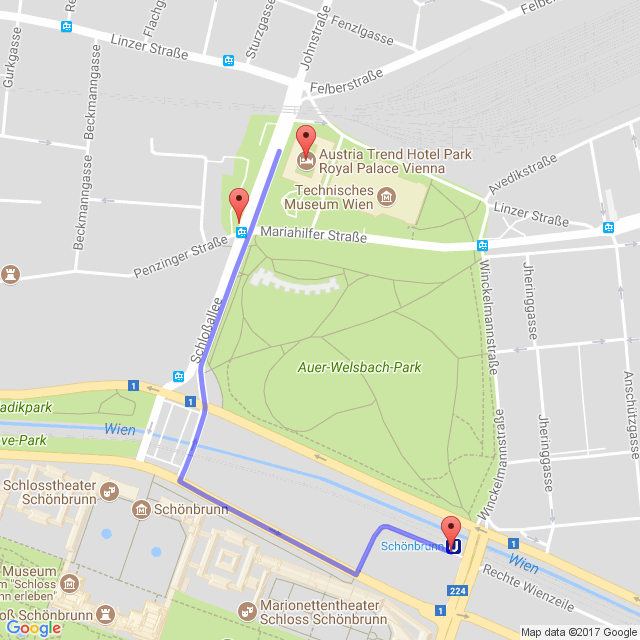 From Landstraße, you can take the U-Bahn U4 (direction “Hütteldorf”) to “Schönbrunn”, from which it is a 15min walk to the hotel (see below). Alternatively, you can take U4 to “Hietzing” (the stop after Schönbrunn) and from there take the tram line 60 (direction “Westbahnhof) or 10 (direction “Dornbach”) to the stop “Penzinger Straße”, which is right next to the hotel. When arriving by train or bus at Wien Hauptbahnhof, you can take tram line 18 to Wien Westbahnhof and from there tram line 60 to “Penzinger Straße”. The DISC’17 Welcome Reception will take place on Monday, October 16, at 18:30 in the grand hall of the Vienna Technical Museum at Mariahilfer Straße 212, 1140 Wien (right next to the conference hotel). Don’t miss this! There will be the opportunity to attend a high-voltage demonstration at the end of the reception. 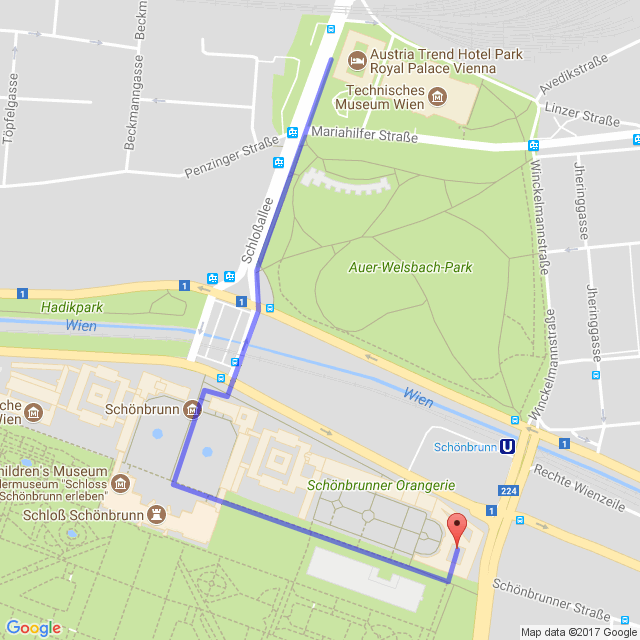 The conference banquet will start on Wednesday, October 18, at 18:30 in the “Apothekertrakt” of Schönbrunn Castle, which is a 20min walk from the conference hotel (see map below). We will meet at the reception desk at 18:00 to walk there as a group. As the main entrance to Schönbrunn Castle and the castle grounds will be closed later that evening, the venue will be exited towards the outside of the castle after the dinner. Vienna can be conveniently reached by plane (e.g., to Vienna international airport VIE), train, bus, or even catamaran. The city has a dense public transport system and numerous Taxi companies. The Vienna tourism office provides detailed information on how to get to Vienna. Wiener Linien (the Vienna public transport operator) has up-to-date information on public transport itineraries and ticket pricing. With world-famous theaters, operas and over 100 museums, there is a lot to do in Vienna! The site of Wien Trousimus provides a great starting point for general information on sights, museums, cultural events, and more. For a fresh look on Vienna, we recommend the Vienna episode of Travel Man; but beware, not everything in Vienna is Mozart and Apfelstrudel! For buying theater tickets, we recommend the official partner site of the Austrian Federal Theaters, where tickets are sold without any vending charges or fees. Viennale, Vienna’s international film festival starts on October 19.